We'd been hearing rumors that the new Thief was in trouble, which made for a worrisome combination with the findings of our columnist/sleuth Superannuation, who last June dug up a distressing amount of turnover at the game's developer Eidos Montreal. A new report at Polygon backs up those earlier concerns, describing a laborious creative process, conflicting visions, high-level staff turnover and a generally troubled development for the high-profile sequel. Citing sources familiar with the studio, Polygon reports that the team at Eidos Montreal has been hamstrung by conflicting creative visions, most of which stem from high-level turnover, as each new senior designer would scrap old ideas and bring in new ones. The team was also sidetracked by a push to create promotional demos, reportedly spending 10 months working on a single demo, which was eventually shown to Game Informer for a cover story and to the rest of the press shortly afterward. 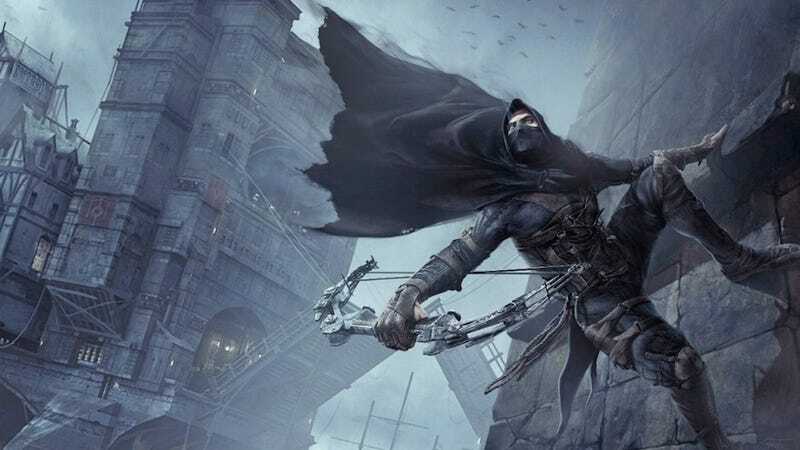 The current version of Thief barely resembles the initial concept, says a source. The vertical slice doesn't load inside Thief's current heavily modified version of Unreal Engine 3. Many programming tricks were necessary to run the current demonstration, like turning off non-playable character AI — the engine has trouble when too many characters are on screen. At GDC in March, I saw the press demo of the game and couldn't quite get a handle on it; it felt as thrown-together as it sounds like it actually was. It was difficult to tell whether or not the game was truly reacting to the player, or even if it was being played at all, in places. We weren't allowed to play the game ourselves, and as with any hands-off demo, were asked to take the developers' word that the game worked as it appeared to. The demo didn't give me what felt like an accurate view of the game, though trashing a hands-off demo felt unnecessary. In the end, I decided not to write it up. One of the more mystifying absences from last week's E3 was Eidos Montreal's Thief 4, a game which has been in development for four years — an amount of time that encompasses the entirety of the development cycle for the studio's first game, Deus Ex: Human Revolution. If a perusal of various online resumes is anything to go by, the project appears to be rather beleaguered. After two-plus years of work on the project, Thief 4 audio director and composer Paul Weir left the Eidos Montreal in March. The month prior, lead level designer Adam Alim went to WB Games Montreal. He apparently is not the only lead level designer to hop off the team —Pierre-Olivier Clement, the previous lead level designer, apparently moved to another project at Eidos Montreal last year. Among other departures: two senior concept artists exited Eidos to a freelance career after nearly two and three years, respectively; a senior technical level designer left last month; a senior animator went back to Ubisoft last September; and a senior level designer moved to something else at Eidos in August. When contacted by Kotaku, the game's publisher Square Enix declined to comment. All in all, sounds like unhappy times for Thief.